The Waiver (Wire) is a column I will be writing for Crucial Sports this season. It should appear on Mondays. It will feature write-ups of players that are available in a lot of leagues. I think you'll find it very useful. You can click the link above to check out the most recent version. 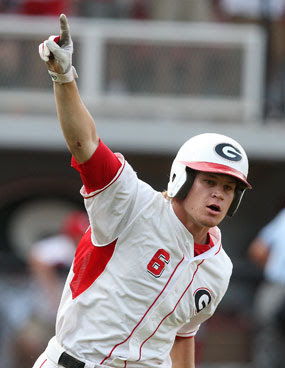 This week one of the player's featured is Gordon Beckham. His performance this spring is making it difficult for the Chicago White Sox to settle for one of their more mediocre options. This is just a small sample from a much larger article. He belongs in the big leagues. Every scout and general manager that has seen Gordon Beckham play this spring has said that he looks ready. He has just 56 at-bats at single-A but White Sox General Manager Kenny Williams would love him to begin the season as the starting second baseman. Though it seems unlikely, Beckham only has to be a better option that the underwhelming group of Chris Getz, Jayson Nix, and Brent Lillibridge. Beckham came from the University of Georgia, which has a level of play comparable to the lower minors. He projects to hit for average and power with the speed to steal bases. He was a shortstop at the University of Georgia but the switch to second should not be a problem. Beckham hit .411 with 28 homers and 77 RBI in 71 games for the Bulldogs. He also stole 17 bases. In 14 games at Class A for the White Sox he hit .310 with 3 homers and 8 RBI. He then went on to the Arizona Fall League where he hit .394 with 3 homers and 13 RBI in 18 games. As of his first ten appearances this spring, he has hit .364 with two homers, five doubles, and six RBI. He belongs in the big leagues. Great tips in the Crucial Sports article. I'll look forward to the column every Monday. Thanks Dave. I definitely appreciate your support. I have the opposite problem of Schrunder, I usually know about the guys too early and I lose patience just as I should be getting excited.